Business in the moment. That’s what the new Sage Live can do for you. Sage Live is a next generation cloud accounting solution that unites your back office and front office through a single, real-time view. This complete business and accounting application on the Salesforce App CloudTM enables users to benefit from a mobile, scalable, global solution so that you can efficiently manage your business. It’s a new business and accounting app that allows you to connect your Salesforce CRM, Sage accounting, and financial data. It offers an Apple native mobile app experience. With three plans to fit your company size and business requirements, there’s a Sage Live to meet your needs. User types are either Full Users, accessing both Sage Live and accounting via computer or mobile, or Business Users, accessing Sage Live from a mobile device only. Pricing is based on the plan selected and the Sage Live user number/type. Using Salesforce, but your sales are not connected with your financials? This is where Sage Salesforce integration comes into action. Sage Live offers full integration with Salesforce as well as thousands of other business apps. And not only is Sage Live natively integrated with Salesforce CRM, the integration is free. 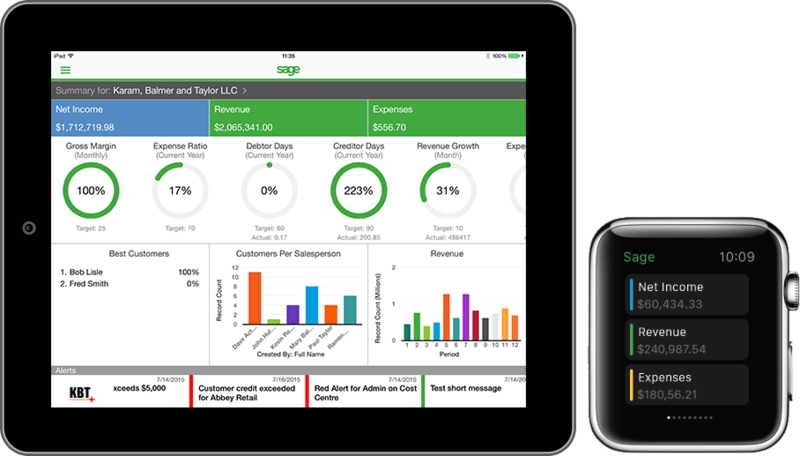 Sage Live is an implementation of the Sage Accounting system that runs directly on the Salesforce App CloudTM offering an alternative to Quickbooks for companies interested in upgrading their accounting system. The Salesforce App CloudTM aggregates and integrates all of your business apps. The seamless Salesforce CRM integration will link sales data with accounting, banking, invoicing, and payments. From an accounting perspective, Sage Live allows you to simplify core accounting and compliance. Automatically post transactions to the account or journal of your choosing with configurable posting rules, automate transactions for repetitive actions thereby eliminating manual data entry and the associated errors. Static ledgers can be transformed into dynamic financials. Reports and dashboards can be presented from multiple perspectives. Plus have access to financials 24/7 as business unfolds. Is expense tracking always a nightmare? Enter travel receipts and manage expenses while on the road with smart capture. Pay bills, integrate banking, create and send invoices, accept payments. All of these can be done with Sage Live. With Chatter, Salesforce CRM’s enterprise social network and collaboration tool, your team can easily keep up with everyone and everything wherever you are located. Vital data can be viewed in a single hub. Sage scoreboards provide shared workspaces on multiple devices to encourage anytime, anywhere collaboration. Imagine receiving live notifications to your mobile device, tablet, or even your Apple Watch. View interactive scoreboards of data integrated from multiple systems, all through a seamless user experience. By eliminating low-value data entry and automating repetitive tasks, you can narrow your focus on what actually drives your business: customers and sales. You can have 1-1000+ users accessing Sage Live across the globe. With its multilingual, multi-legislation, multi-currency, multi-national, and multi-company capabilities, Sage Live truly provides a global accounting solution. Step into the future. Sage Live connects CRM, accounting, and financial data all into one solution so you can save time, eliminate errors, and have complete visibility across your organization. Does this article spark additional questions that you would like to learn more about Sage Live or how Salesforce Sage integration works? Give us a call at 866.436.3530 and we would be happy to answer any questions you may have.